Welcome to Wholesale Girls! And the opportunity to add glitz, glam and shimmer into your fashionable selection of hats, headbands, hair bows, flower clips and more with Rhinestone Embellishments! At Wholesale Girls, we sell Rhinestone Embellishments that are a full three-quarters of an inch in diameter, creating lots of sparkle. Our glittering Rhinestone Embellishments feature a sparkling center stone that is surrounded by additional stones, creating a stunning appeal. Our Rhinestone Embellishments are perfect for many different types of projects. Each of these adorable rhinestones are crafted from quality stones, giving them an elegant appearance that is hard to resist. When you think pretty, think Rhinestone Embellishments at Wholesale Girls! Tiny Stone Embellishments feature a center stone surrounded by 8 smaller stunning stones. These rhinestone embellishments are perfect for any season, any special occasion, and any fashionable outfit or head wear. They are easy to match up with different styles of fabrics and prints too! Glittering bits of feminine finery, our rhinestone embellishments and Tiny Stone Embellishments are must-have accessories for any fashionista! Rhinestones may not be diamonds, but they sure are pretty to look at and wear. Check out our collection of rhinestone embellishments and discover their beauty for yourself. Wholesale Girls Tiny Stone Embellishments are very popular, we sell these glittering rhinestones in a 50-piece lot as well as individually. No matter what you are decorating, our rhinestone embellishment collection is a perfect choice. Use them to create a spectacular design on cotton tees, headbands, shoes or velvet hats for an extra touch of fashion. Embellishments are so easy to add to an outfit, when designing shoes, headbands or any fashion accessory. Embellishments allow you to create an entirely new look at very little cost. From acrylic embellishments to tiny hair bows to round crystal embellishments to crochet daisy embellishments. You have so many options that you can use to add a touch of color and glamour to your crochet hats, colorful tutus, hair clips, and more. Embellishments can be used to brighten up an otherwise dull or plain outfit or fashion accessory. Embellishments can also be used to create your own style of hair barrettes using hair clips or alligator clips. Glittery embellishments such as round crystals add a nice touch of shine and brightness that is easily noticed. No matter what type of embellishments you decide to use, the end result is a more attractive and visually appealing look. Why not purchase several varieties of embellishments and try them out for yourself? The post Rhinestone Embellishments at Wholesale Girls appeared first on Kay Boutique – Little Girls Clothing Wholesale Boutique & Accessories. Did you know bows are back?! Little girls to big girls are now using them for the prettiest hairstyles. 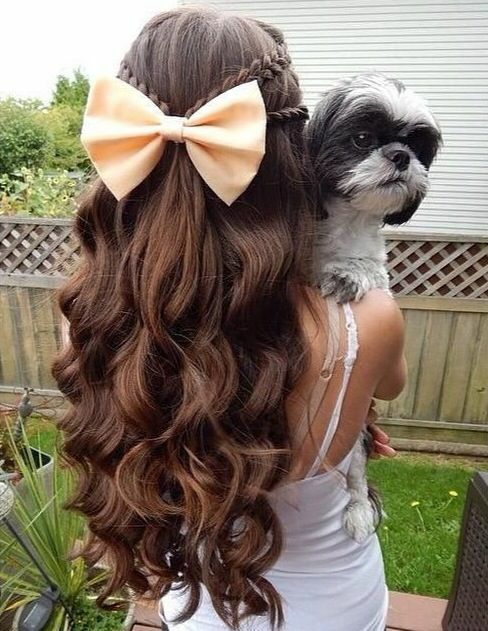 We thought it would be fun to show off some of our favorite hairstyles with bows to give you some ideas on what you can do with all of the ones you purchase from us. This one is so beautiful and easy to do. Part the front part of the hair and grab a bunch towards the center of the head. Braid it back and then secure it with a bobby pin. Do the same to the other side. Now, move down on the side of the head, and grab some hair there. Braid that all the way back and do the same to the other side. Put the four braids together, and secure it with an elastic. Finish it up with a bow in the middle. This one is similar to the previous one, but it goes into a side pony. All you need to do is grab four sections of the hair and braid them back. Bring up the rest of the hair on the side, and secure it in a ponytail. You can then add the bow to give it that beautiful finishing touch. This is another great way to use a bow. Part the hair in the front, and then twist each side towards the back of the head. You can secure one twist with a barrette or bobby pin while you twist the other side, and then secure them both with an elastic. Place the bow on top of the elastic to make it pretty. Tip: You can work hair into the twist or just twist the bunch of hair you’ve grabbed. Try it both ways to see which one you like the best. Dress up a bun with a bow! Just make a bun in the middle of the back of your head or towards the top, and then place the bow directly underneath. This looks awesome when you use a bow that matches an outfit because you’re dressing up the back of the head. Wholesale Girls has the widest selection of girls’ bows online. You can find many different colors and patterns to match just about any outfit. Many of the bows are perfect for little girls, teens, and even adults. Bows on any age is trending now, so don’t be afraid to return to your youth by wearing them. All of our bows are priced low, so most people can afford to buy as many as they need. If you purchase $50 or more, you will receive domestic shipping at no cost. We just want to help you and the little girls in your life look as beautiful on the outside as on the inside. Find all of our bows here. The post Stylish Girls’ Hairstyles with Bow appeared first on Kay Boutique – Little Girls Clothing Wholesale Boutique & Accessories.